Visit the Key West Aquarium to learn about various types of marine life while visiting some of the other exhibits in the building. Guests can also interact with some of the animals and watch as the workers feed the animals. There is also a souvenir shop and a place to get a snack or drink during the day. After entering the aquarium, guests can explore the underwater world of Key West and other areas of the country. There are educational sessions where guests can learn about how the animals live in the water and where they are originally from before arriving at the aquarium. Guests can view alligators of all sizes as they move across the rocks in their exhibit or view colorful fish of all kinds as they swim in the large tank. There are also a few sharks and turtles to see. There is a small pool where guests can touch starfish and other animals, such as crabs and sea urchins. Feeding times are posted as soon as guests enter. There are special events held during the year for school groups and visitors. Classes are welcome to visit the aquarium to learn about the animals in small groups. This is an attraction in Key West that is located close to other adventures to enjoy. Guests can view all types of animals that include turtles and sharks. Questions are encouraged, and guests can purchase a few souvenirs before leaving. Get up close and personal with sea life at the renowned Key West Aquarium. Make your way to the aquarium and begin your tour of various underwater worlds. Learn about the lives of the creatures of the sea. Explore the diverse habitats of different parts of the ocean all in one place. Watch alligators scuttle across craggy rocks and see jellyfish drift through turquoise waters. Watch in amazement as jagged-tooth sharks power through their tanks in search of prey. You'll learn a lot about the animals and their native environments. Play with gentle animals like sea stars, sea urchins and hermit crabs in the Touch Tank. 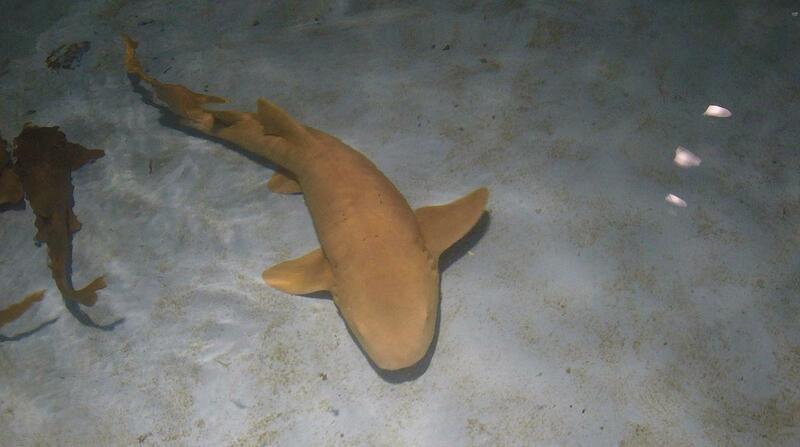 Watch the aquarium's sharks, turtles and rays eat during feeding time and find out about their eating habits. You can even pet a live shark, if you dare. Through its association with the Turtle Hospital and the Sea Turtle Stranding and Salvage Network, the aquarium is home to a number of sea turtles recovering from injuries. Enjoy your visit with these survivors. And don't miss the Atlantic Shores Exhibit — a 50,000 gallon tank reminiscent of a mangrove environment that is teeming with tropical fish. Departure Times: 10am to 6pm Hours are subject to change without notice. It is advised that you call prior to your date of travel to confirm hours of operation.